Quality It's In Our Name | C/G Quality Testing Inc. Since being established in 1983, C/G Quality Testing has been providing the service of Non-Destructive Testing (NDT) to companies both locally and worldwide. 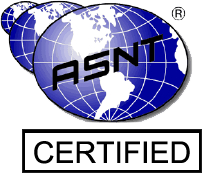 Our inspectors are certified to ASNT TC 1A, Level II in the practice of Ultrasonic (UT), Magnetic Particle Inspection (MPI), Liquid Penetrant Inspection (LPI), and Visual Inspection in order to meet industry standards. Along with meeting inspection needs, C/G can also provide assistance in writing NDE and Weld procedures. C/G Quality Testing specializes in on-site inspections. Through years of experience, we have found that the best way to meet our customers’ needs has been to go to them. Performing inspections on-site at your facility helps you keep the flow of production without the waste and added cost of sending out inspection articles. Simply call to set-up an inspection, whether it is a week or one day in advance. Same day service is also available with no additional cost.